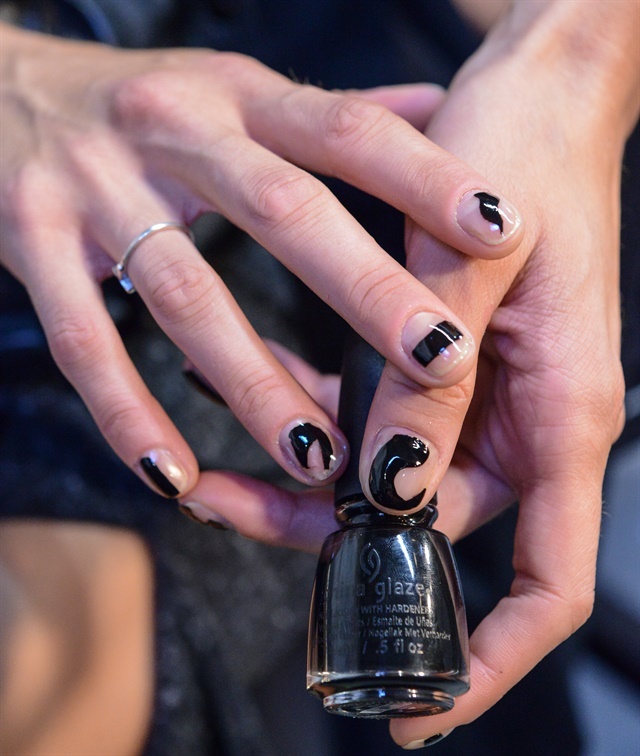 China Glaze executed nail art for three shows at NYFW. Nail leads Naomi Yasuda, Honey, and Miss Pop worked with designers at Opening Ceremony, Proenza Schouler, and Rachel Antonoff to create unique works of art. 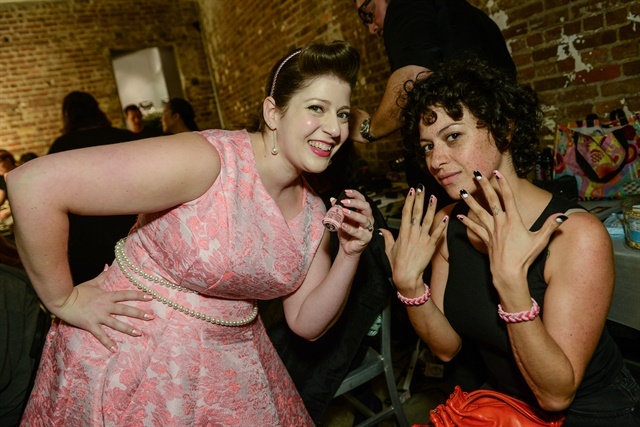 Opening Ceremony’s “Pageant of the People” event celebrated the story of American immigrants and featured bold nails from China Glaze. Yasuda was inspired by the patterns in the collection, particularly the bold stripes and waves. The color palette was primary-colored stripes on a black tip with negative space at the base and waves in two shades of gray, bright blue, and white at the tip of the natural nail. The nails are bold, modern, and wearable. To get the striped look, paint two coats of Liquid Leather, leaving the bottom of the nail natural to create a negative space. Alternate between Happy Go Lucky, DJ Blue My Mind, Change Your Altitude, and Hey Sailor to make a single horizontal stripe along the bottom. Seal with top coat. For the waves, start about ¾ of the way up the nail and paint two coats of Liquid Leather. Alternate between Happy Go Lucky, DJ Blue My Mind, Change Your Altitude, and Hey Sailor to create a single horizontal stripe across the nail along the black. Leave the bottom unpainted. Seal with top coat. Nail artist Honey created a modern and chic abstract line in Liquid Leather for Proenza Schouler. The painted lines were freehanded so no two models wore the same look. The design was capped with top coat for a high shine, negative space final look. Designer Rachel Antonoff collaborated with Archie Comics for her spring collection. Miss Pop brought to life quirky nail art looks to top off the collection. Nail looks featured hearts, punctuation marks, and speech bubbles. To recreate the hearts, paint two coats of White on White as a base. Use a striper brush dipped in Hot Flash to make short strokes, forming a sketchy heart shape. Paint a couple of red hearts per nail. Paint more hearts in Something Sweet. Seal with top coat. When nails are completely dry, use a fine-point permanent marker to outline the hearts. To create the Chit Chat nails, start with a mix of White on White and Pink or Swim. On pink nails, use a striping brush dipped in Liquid Leather to make a rectangle up the center of the nail from the cuticle. Dip a dotter into Liquid Leather and dab it close to the rectangle to finish the exclamation mark. On the white nails, use Liquid Leather and swipe in an arc to the left and then back to the right, leaving a half-moon at the bottom of the nail. Fill in the rest with the remaining polish. Use China Glaze Stripe Rite Best in Show to form the tip of the speech bubble. Seal with top coat. To make a full heart reverse French, paint two coats of White on White. Choose a pastel shade (colors used here were Sweet Hook, Pink or Swim, Re-Fresh Mine, or Don’t Be Shallow). Using the brush in the bottle, get a good bead of polish on the tip and drop it down ¼ of the way up the nail and to the left. Repeat on the right to reveal the heart. Let your polish set then seal with top coat. 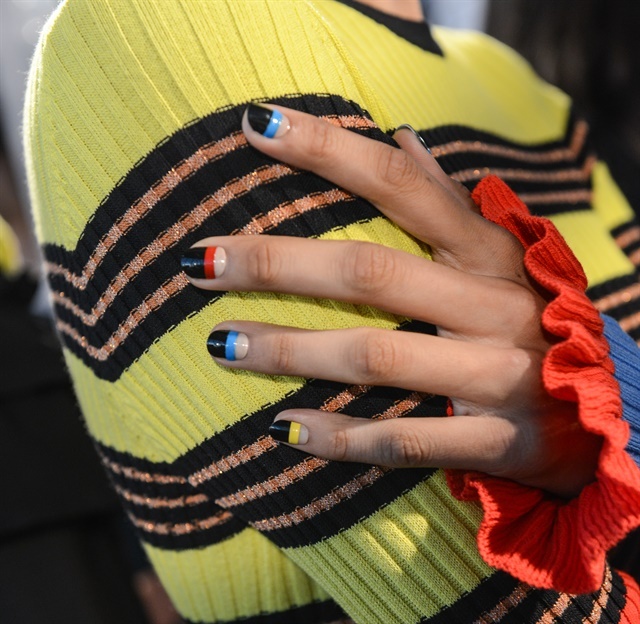 See all the nails and nail art from NYFW by clicking here.